About – Circle CRM Group Inc.
We are professional archaeologists who share a common mission: to protect and promote understanding of historic resources. We believe in a balance of practical growth and development while preserving our cultural resources for future generations. Through great teamwork and collaboration we deliver consistent, quality historic resource services that exceed our client’s expectations. Meet our team of archaeology nerds! Margarita has over 18 years of extensive archaeological experience and knowledge in all services related to historical resource consulting. 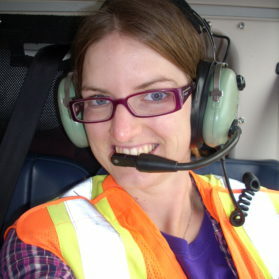 She is an approved permit-holding archaeologist in Alberta, Saskatchewan, Yukon and the Northwest Territories. Throughout her consulting career, Margarita has managed many large scale HRIAs and HRIMs, and recorded numerous historic resource sites. 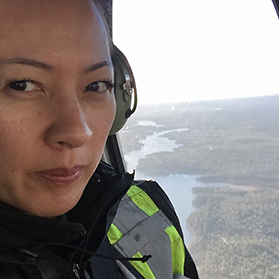 Her experience includes field assessments and mitigations for projects ranging from small-scale oil and gas to Class I pipelines and Forestry Management Areas, as well as infrastructure, power, residential/industrial subdivisions, and other developments in the private and public sector. A graduate of the University of British Columbia, Simon Fraser University, and Durham University (UK), Margarita holds degrees in both Archaeology and Economics. Her Masters studies involved relational artifact analysis of three sites in central Europe: Austria, Hungary, and the Czech Republic. Upon completing her studies, Margarita spent 5 years working in Europe on a variety of archaeology sites including an Iron Age hillfort in Schwarzenbach, Austria, a complex Roman bath site in Grumentum, Italy and an Urartu fortress outside Yerevan, Armenia. Margarita also founded and co-directed the SVG Public Archaeology Program, a non-profit rescue excavation on the Caribbean island of St. Vincent. With the help of a select team, she completed two seasons of public excavations. 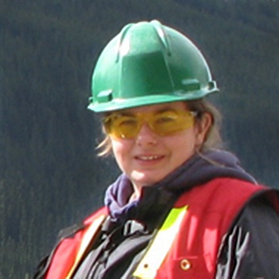 Kristin has over 18 years of archaeological experience, and is a qualified permit-holding archaeologist for BC (Interior Plateau and Sub-Arctic/Boreal Forest), Alberta, Saskatchewan, Yukon, and Northwest Territories. She has been responsible for all aspects of HRIA/AIA and HRIM work for small to large-scale developments throughout these regions. With extensive experience in GIS, Kristin is responsible for much of the mapping and desktop assessments conducted at Circle. Having earned an M.A. and M.Sc. applying GIS to archaeology, her masters thesis focused on the creation of a 3D model of the Lucanian site of Roccagloriosa in southern Italy and the Lunt Roman Fort near Coventry, England. 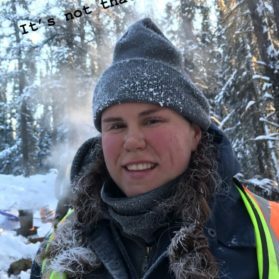 Kristin also worked a number of years as an archaeologist in England, and has developed archaeological management and predictive models for large-scale operations in northern Alberta. Jode has over 18 years of archaeological experience, 13 of which have been spent in Alberta as a field archaeologist and site supervisor. He is a permit holder for the Interior Plateau in BC. Having worked in a variety of sites throughout Alberta, BC, Ontario, Jordan and the Caribbean, he is highly knowledgeable in diverse archaeological assemblages. In 2011/2012, he had the opportunity to be Field Director for the SVG Public Archaeology Program on the Caribbean island of St. Vincent. From May to November, he can be found at our seasonal office in Williams Lake, leading our BC team throughout the Cariboo and the Kootenays. When it comes to huffing it through the forest, he can’t be beat. 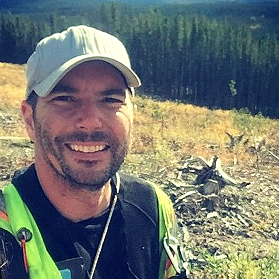 Matt bring two decades of experience to the Circle team, having worked in Alberta, Saskatchewan, the Yukon and the Northwest Territories in a wide range of environmental zones. His Masters research involved the analysis of distribution patterns of tipi rings and other sites near medicine wheels in southeast Alberta, and, notably, he led the excavations of the Hardisty Bison Pound and an associated campsite that was determined to be among the most important Avonlea sites on the Northern Plains. 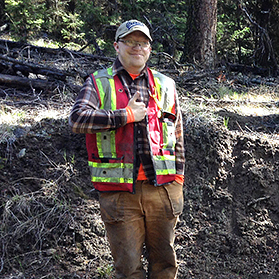 Matt has led excavations of over a 1,000 square metres in Alberta, and probably participated in 1,000 more. We are excited to have him join our team as he works on his Ph.D., and we’re hoping he brought his luck with him! Fun fact: he doesn’t like winter archaeology. But who does?! 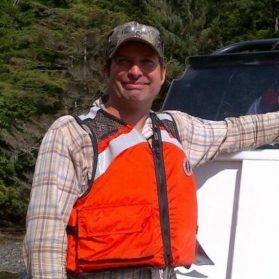 Michael Ross has 18 years of experience working in consulting archaeology in Alberta, British Columbia, Manitoba, and the Yukon, and is a qualified field director in British Columbia (Interior Plateau, Sub-Arctic/Boreal Forest, and Coastal regions). 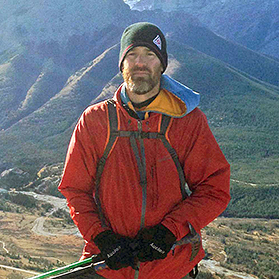 Michael has participated in and/or directed numerous AIAs for forestry, oil and gas, hydroelectric, mining, infrastructure, transportation, and land developments throughout BC, has held a permit for a proposed mine expansion in the Yukon, and has participated in additional excavation projects in Idaho, Baja California, and Baja California Sur. When not working, Michael enjoys being outdoors hiking, snowboarding, and gardening. So basically, he loves his job! 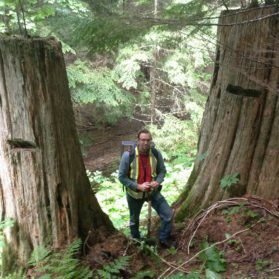 Lucas is a field archaeologist with a BA double major in Anthropology and History from the University of Victoria. Based on Vancouver Island, field school found him investigating clam gardens. But when Circle discovered him in 2013, he left the clam gardens and became a field supervisor on our BC team. We think he’s having more fun with us. Fun fact: Lucas loves CMTs! 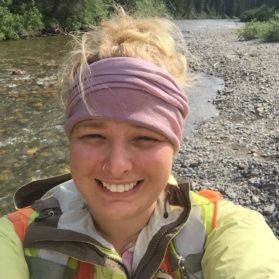 Brooke is a field archaeologist with six seasons of field experience including mitigation and survey in BC, Alberta and Saskatchewan. A graduate from the University of Calgary, Brooke has been working in CRM since her university days. Brooke is quite possibly the happiest person on earth; she has a great attitude and she snaps into action whenever quads, argos, rhinos or people get stuck. Because of this, she has been designated Circle’s Culture Champion, ensuring morale is always high and our staff are always happy. 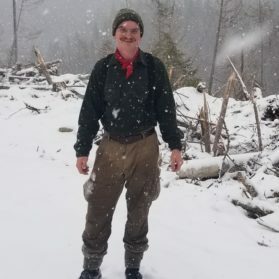 Ewald is an established archaeologist with over seven years of experience across western Canada, having participated in numerous surveys and excavations in BC, Alberta, Ontario, and New Brunswick. A graduate of the University of Calgary, Ewald is multi-lingual and is multi-talented; he makes his own soaps and is an avid woodworker. If you ever want to learn what it would be like to live as a Victorian, ask Ewald in English, German, or Afrikaans. Jennifer brings 7 seasons of archaeological experience to the team. She received her B.Sc. 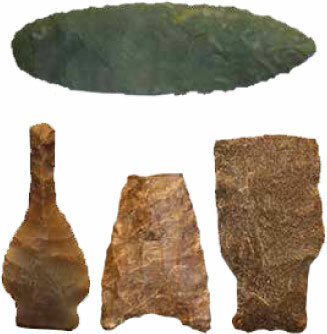 in Archaeology from the University of Calgary and has completed extensive archaeological survey and mitigation throughout, BC, Alberta, Saskatchewan, and Manitoba, as well as the Northwest Territories. Jennifer’s reputation for getting things done when things go wrong, jumping into action to repair your Argo or your spirit, make her an asset to any field crew. In her spare time, she enjoys training for half marathons and eating ice cream, sometimes at the same time. You can call her many things; she just asks that you do not call her Jenny. Duncan joined Circle’s BC team in 2015, straight out of Kwantlen Polytechnic University (Richmond, BC) with a Bachelor’s Degree in Anthropology. His great attitude, efficiency and ability to learn quickly have made him a valued member of our team. It only took us three seasons to get a photo of him! And now he is a Supervisor. Way to go Duncan! 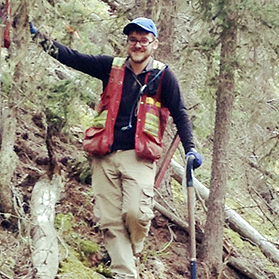 Kyle has 15 years of archaeological experience in Alberta and Manitoba and extensive experience in archaeological survey and mitigation in a variety of environmental zones: the Montane Cordillera, Boreal Forest, Plains, Parkland, and the Canadian Shield. Kyle holds a BA in Anthropology from the University of Winnipeg and has also dabbled in palaeontology. When he’s not busy studying past remains, Kyle spends his free time in the backcountry of the Canadian Rockies. 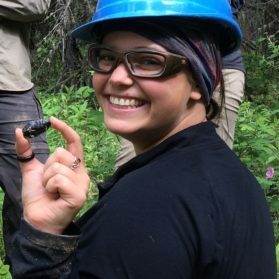 Amanda is a field archaeologist with a BA from the University of Calgary; she has participated in excavations in Poland and the Yukon, and joined our field crews in the past two years in Alberta and BC, hiking/sweating/digging/avoiding wasps with the best of them. She initially joined Circle as a GIS practicum student, but we’ve decided to keep her forever! Amanda is a valuable asset to our GIS initiatives; she’s already created two predictive models and is working on more. Fun fact: She loves wild blueberries. 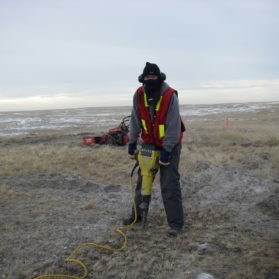 Tyler is a field archaeologist with roots on Vancouver Island but he has worked in various locations in western Canada, including mitigative excavations and survey work in southern and central Alberta, southeast Manitoba, and in the Peace region of northeast British Columbia for the past five years. Tyler received his BA from the University of Victoria, and is a PADI certified scuba diver, as well as a “Magic the Gathering” competitive champion. Andrew has a BA in History from Mount Saint Vincent university and an MA in photographic preservation and collections management from Ryerson University. 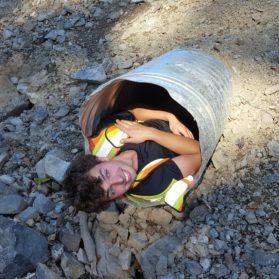 He has been working in archaeology for more than 3 years, participating in both surveys and excavations, but this is his first full year with Circle outside of his home province of Nova Scotia. He enjoys photography, is a huge film buff, and loves to cycle, but he has never been in a canoe (he hopes to change that this summer)! Maegan grew up in the central interior of BC, and is from a farming/logging family. A graduate from the University of Calgary, Maegan spent an entire summer on the Caribbean island of Saba excavating a 17th century sugar plantation while in university. 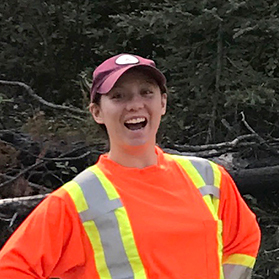 After taking some time off to teach English in China, Maegan has been working in consulting for the past two years, gaining experience in Alberta, the Northwest Territories, and Nunavut. She loves outdoor adventuring; kayaking, biking and hiking are among her favorite activities. Also, Maegan is a three time provincial sheep shearing champion. Baaa! Luke is a new field assistant with one full year of consulting archaeology under his belt. He is joining us from across the pond, as he tries to do everything Canadian during his two year working holiday abroad. Luke received his B.Sc. in Archaeology from Bournemouth University and has participated in archaeology across the UK, Nova Scotia, Ontario, and BC, as well as Peru. 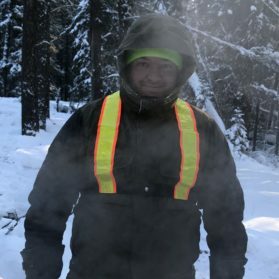 He enjoys climbing a good mountain almost as much as he enjoys new wave music, but the highlight of his first field season in Canada was seeing the world’s largest cross country skis while working in 100 Mile House. Who wants to join him in a tour of all giant things in Alberta?